The Matrix E50 is On Sale! Matrix Fitness has the fastest growing brand of any commercial fitness equipment company in the world. You can imagine that we were pretty excited when they released a new line of machines designed for use right in your own home. The Matrix E50 is a suspension elliptical with a compact footprint, Exact Force Induction Brakes, multi-grip handlebars, and a choice of three consoles. The parent company, Johnson Fitness, is also the manufacturer of Horizon and Vision ellipticals. The company manufacturers all of their own machine components so their products tend to be low maintenance and well-built. With multiple console options, you can choose the level of tech and display quality that best suits your budget and preferences. WEEKEND SALE ENDS MONDAY: The Matrix E50 Elliptical is on SALE! Choose from three different consoles to customize your machine’s technology. The Matrix E50-XR is typically priced around $2,399. The Matrix E50-XER is typically priced around $2,899 and the Matrix E50-XIR is usually priced around $3,399. You may also want to check out the Life Fitness X3 for premium quality. 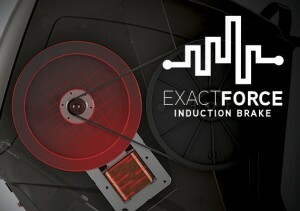 Exact Force Induction Brake – This braking system is more precise than the standard ECB system used by the Matrix E30 and most other ellipticals. The Matrix E50’s resistance system has no moving parts and instead relies on the latest technology to provide instant and smooth resistance transitions at the touch of a button. It tends to be more quiet and durable than other machines too. Suspension Elliptical Design – The Matrix E50 is a suspension elliptical so it does not have rollers and tracks which often add noise and uneven motion. Instead, you’ll be on pedals suspended above the ground. Suspension ellipticals provide a smooth and quiet ride not found with other types of machines. Compact Footprint – One of the top advantages of the Matrix suspension ellipticals is their small footprint of only 57.5” x 29.5”. This is much smaller than the typical 80” found on many ellipticals. 20” Stride Length – The 20” stride length will work well for almost all users and provides a comfortable and smooth workout experience. 9.1” Step-On Height – Many rear-drive ellipticals are hard to mount because you need to step over the mechanics in order to reach the pedals. This can be a challenge for older users with limited mobility. This machine is easy to mount with a low step on height. Warranty – A warranty is a good indicator for the amount of confidence a company has in their product. 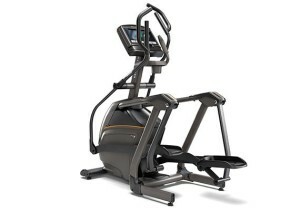 The Matrix E50 elliptical has a lifetime frame warranty, 7 years parts, and 2 years labor. 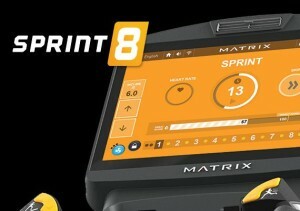 Sprint 8 – We really like the Sprint 8 High Intensity Interval Training program on the Matrix and Vision machines. This program allows you to work out just 20 minutes a day, 3 times a week, for 8 weeks to achieve impressive results. Short intense workouts do a better job of increasing your heart rate and burning fat over a longer period of time than extended slow workouts. The Sprint 8 program is designed to automatically progress through the interval stages with an on-screen display while a virtual coach guides you through the workout. 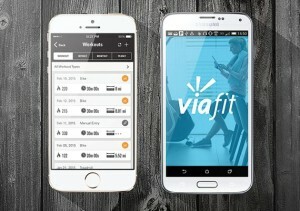 ViaFit – There are a number of workout tracking platforms available from other elliptical brands, but ViaFit does the best job of incorporating many of the fitness tracking apps that you’re already using into one interface. For instance, you can use ViaFit to track elliptical workouts, outdoor runs with MapMyRun, or steps at work from your FitBit. All of the data is stored in one place so you can set goals, join online challenges, and track your progress. The program is free, which is a huge plus when you consider that competitor trackers, like iFit Live, require an ongoing subscription. Virtual Active – Virtual Active allows you to work out while viewing a virtual course on the display of your Matrix elliptical. The console comes with two courses, but more courses can be purchased and uploaded via thumb drive. 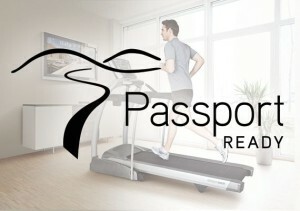 A Passport Player can also be purchased and used to link your machine to a television for a larger viewing screen. Virtual Active is only available on the XER and XIR consoles, however the XR console is Passport Player ready so you don’t need to miss out on your virtual courses. One of the best things about Matrix ellipticals is that you can choose which level of console you want. Each of the three options varies in price and features. XR Console – This basic console is on sale for $2,399 and includes an extra wide 8.5” blue LCD screen with basic level stats. The XR console also includes ViaFit connectivity, is Passport Ready, and can link to a wireless heart rate monitor. XER Console – For an additional $500, you can instead choose the XER console with its 10” touchscreen, 10 workout programs, Bluetooth connectivity, USB port, Virtual Active, ViaFit, Passport Ready, and Console apps. The apps are display like they would be on a smart device and include apps for Sprint 8, Weather, a Web Browser, Netflix, Hulu, Facebook, Twitter, and YouTube. XIR Console – Finally, if you want the top-of-the-line technology, you will want the Matrix E50 with the XIR console. This display has a 16” HD touchscreen along with Bluetooth, a USB port, Virtual Active, ViaFit, Passport Ready, and Console Apps. This comes with 11 workout programs. The main advantages of the Matrix E50 over the E30 model are the addition of the Exact Force Induction Brakes, additional resistance levels, multi-grip handlebars, and cushioned foot pedals. Both machines have a very compact footprint that would fit well into a smaller home and an extremely quiet and smooth ride. If you’ve never been on a suspension elliptical, you should definitely visit a nearby gym and try one out. They may be more expensive than traditional ellipticals, but the absence of tracks and rollers cuts way down on noise and delivers a silky smooth ride. The only negative point we can find on this machine is that it does not have the ability to change incline levels. If you want this feature, you should look at the ascent trainer suspension ellipticals from Matrix including the A30 and A50.